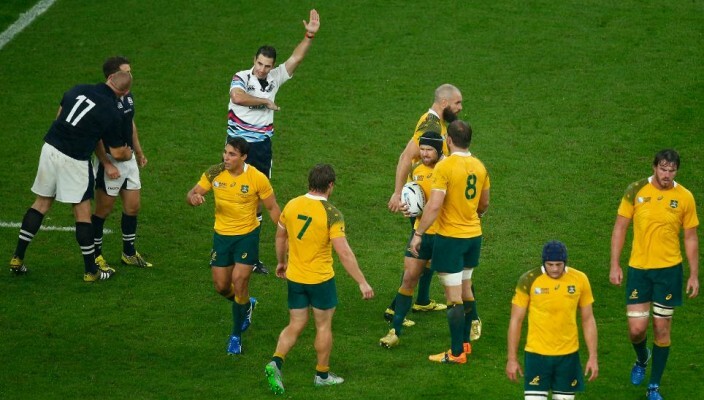 Following a full review of match officials’ performance, the World Rugby match official selection committee has clarified the decision made by referee Craig Joubert to award a penalty to Australia for offside in the 78th minute of the Rugby World Cup 2015 quarter-final between Australia and Scotland at Twickenham. The selection committee confirms that Joubert applied World Rugby Law 11.7 penalising Scotland’s Jon Welsh, who had played the ball following a knock-on by a team-mate, resulting in an offside. On review of all available angles, it is clear that after the knock-on, the ball was touched by Australia’s Nick Phipps and Law 11.3(c) states that a player can be put on-side by an opponent who intentionally plays the ball. It is important to clarify that, under the protocols, the referee could not refer to the television match official in this case and therefore had to rely on what he saw in real time. In this case, Law 11.3(c) should have been applied, putting Welsh onside. The appropriate decision, therefore, should have been a scrum to Australia for the original knock-on. Overall, it is widely recognised that the standard of officiating at Rugby World Cup 2015 has been very high across 44 compelling and competitive matches to date. All match official performances are thoroughly reviewed and assessed by the World Rugby Match Official Selection Committee comprising John Jeffrey (Chairman), Lyndon Bray (SANZAR), Andrew Cole (SANZAR), Donal Courtney (EPCR), Clayton Thomas (Six Nations) and World Rugby High Performance Match Official Manager Joël Jutge. Appointments for the semi-final stage of the competition have been announced.